Quilt measures 57" x 57"
A beautiful stitchery quilt that combines both stitchery and pieced blocks. As many fabrics are used in this quilt, it is a great way to use up stash fabrics while giving the quilt a lovely scrappy look. 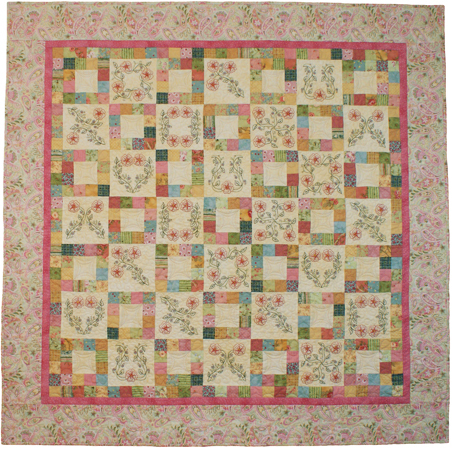 The quilt has eight different flower stitchery blocks, each repeated three times. This pattern includes full sized patterns and full instructions. It would a great project to start building your embroidery and quilting skills, as it is suitable for all skill levels.